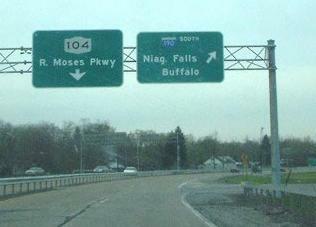 A pair of NB exits courtesy Doug Kerr; note that I-190 left-exits itself at I-290. 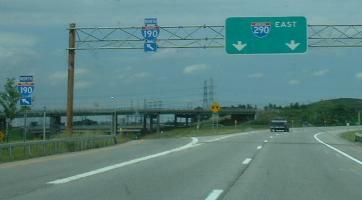 The Niagara Extension was a barrier-tolled system, leaving the exits free to be optimally designed for throughput instead of tied to a toll plaza location. 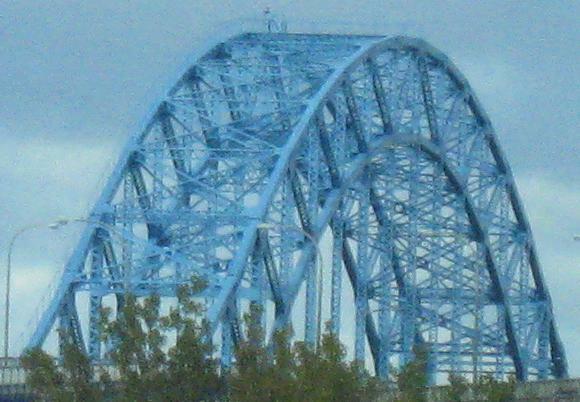 The Peace Bridge seen from I-190 NB and the adjacent 1958 Massachusetts Ave. pumping station. 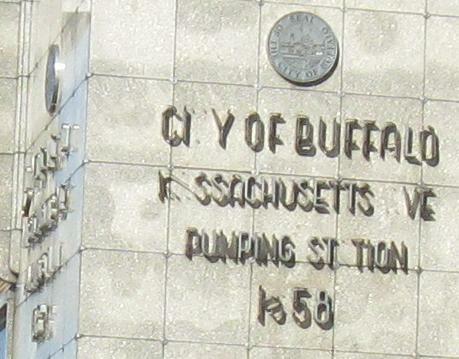 Now seen from I-190 SB, passing Ferry St. (the Squaw Island connector). 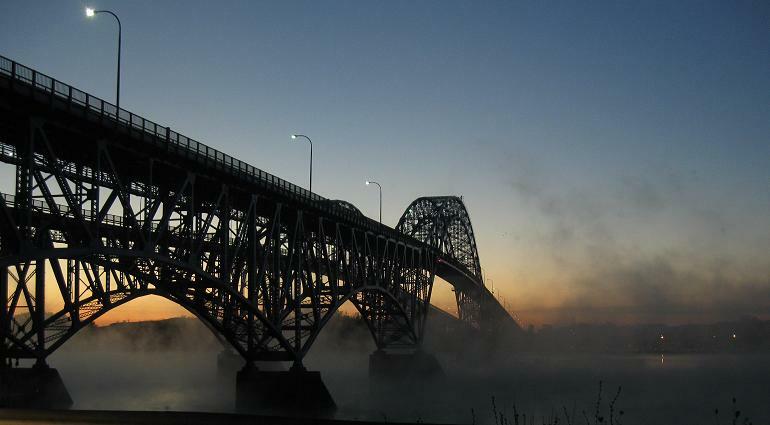 I have plenty more views seen from Squaw Island - visit the Peace Bridge link below. 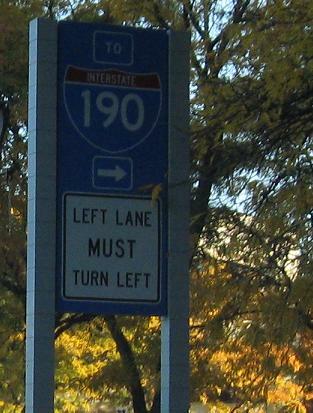 Very non-standard exit sign coming off the South Grand Island Bridge SB, where NY 324 exits but is unsigned, then the remains of the former SB toll plaza just south of Exit 11 (NY 198, Scajaquada Expwy.). 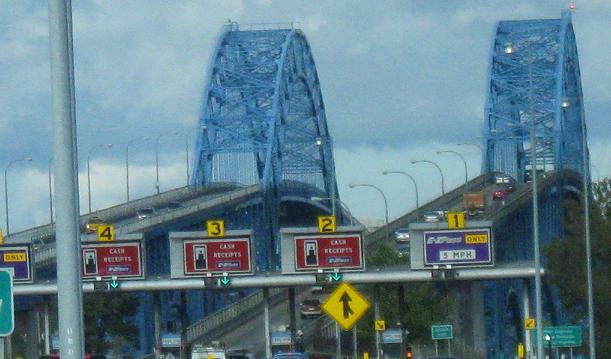 This is why I used the past tense when talking about I-190's tolls - the Grand Island tolls are still there but are more bridge tolls than mainline barrier tolls. 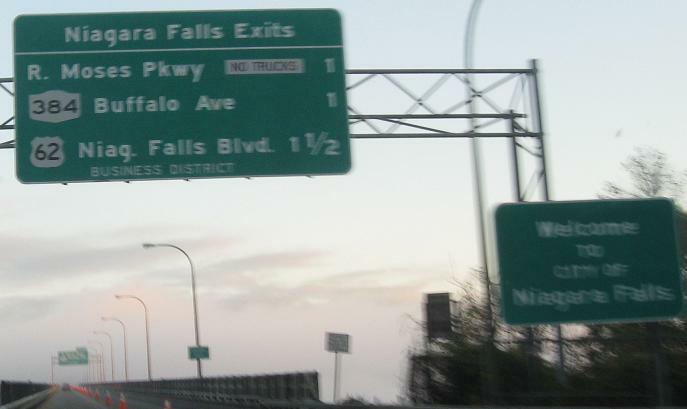 All of the exits were prefixed with N for Niagara when this was on the Thruway toll system, even though the part of I-90 it connects to is free so you'd never see their exits on the same ticket. 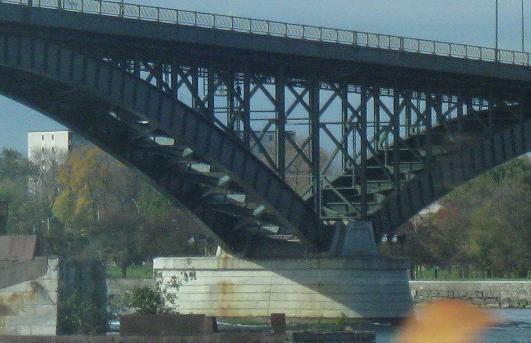 The South Grand Island Bridge is much more beautiful than the North one, what with its arched trusses and trussed arches. You'll see it again at the bottom of the page. NB across the North Grand Island Bridge. There's more button copy than this, but first of all you see how narrow the bridge is, second of all there's only one lane due to construction, and third of all, to top it all off, the fog decided to be incredibly dense that morning. Between Grand Island and La Salle, I was lucky to get two good photos. 3rd St. NB in Niagara Falls. 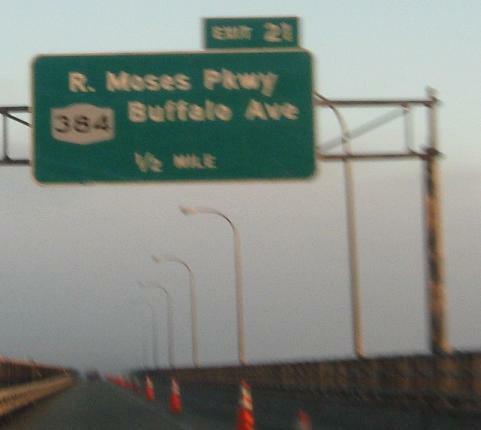 I think the route is Niagara St. to 8th St. into Robert Moses State Parkway. The remaining photos are courtesy Doug Kerr. 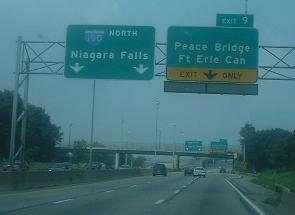 Three SB exits entering Niagara Falls. Upper Mountain Rd. 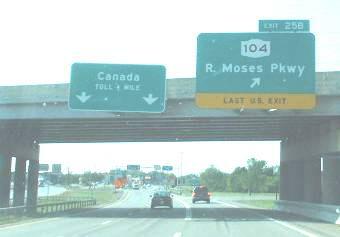 SB above I-190 near Lewiston (thanks, Gregory Duke). Upper Mountain Rd. NB from NY 104. 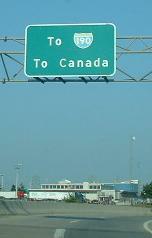 Because once you're in Canada, it's really all the same. 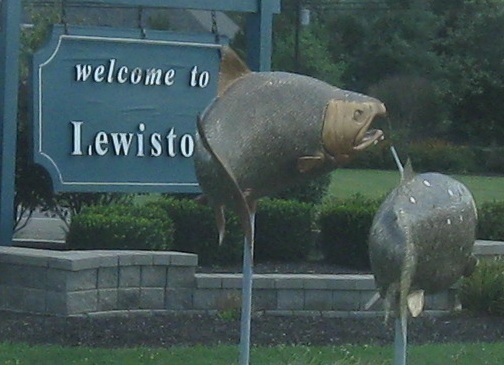 On the NB Exit 25A ramp, what looks like salmon (trout? neither? I'm not a fisherman) greeting people who want to stay in the U.S. "So I says to Mabel, I says... Hold on, car coming... 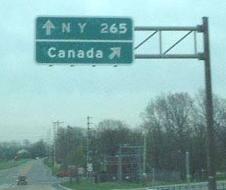 Anyway, so I says to Mabel..."
Exit 21A to Lasalle Expwy. 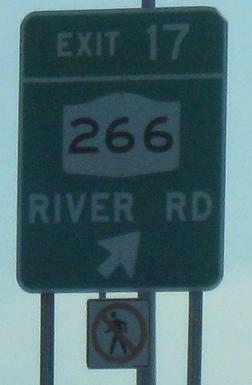 Exit 25B to Robert Moses State Pkwy.